In the eye of the whirlwind of automotive history that surrounds the illustrious Ford GT 40 lies a feud between two prestigious automakers from two distinctively different continents. In the spring of 1963, the Ford Motor Company entered negotiations to purchase an Italian sports car producer called Ferrari. 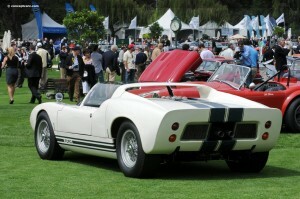 In the closing days of what have proven to be one of the most important automotive partnerships in history, Henry Ford II was left to lick his wounds after the chief executive and founding father of Ferrari, Enzo Ferrari, cut-off negotiations in a furor over Ford’s refusal to allow him control of the open-wheeled Formula One style racing program. Enzo went on to gain a reputation as a heavy-handed, albeit successful racing coordinator but made a powerful enemy in the process. After spending a ton of money on market research, a thorough audit of Ferrari assets, and extensive legal wranglings, Henry was outraged and began to seek out a source that could build a Ford powered car that would embarrass Ferrari on the world racing stage. 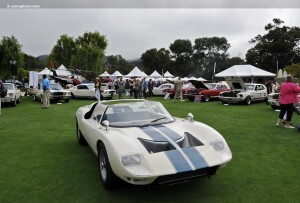 With Henry’s breath, the Ford GT 40 was put into conception. 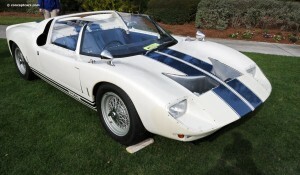 It was decided that Lola Cars International would be awarded the daunting task of creating a “Ferrari-beater.” Lola was a British performance car manufacturer that previously used Ford engines in their high=performance vehicles. After a period of unsuccessful campaigns at numerous 24-hours of Lemans events from 1963 until 1965, the project was finally brought back to the U.S. and given to legendary racer and car builder Carrol Shelby and his crew at Shelby American Incorporated (SAI). 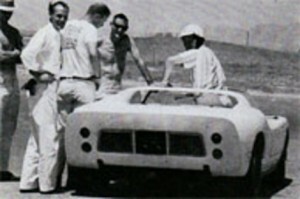 Under SAI the GT 40 won a single race in 1965, the Daytona 2000. SAI went on to win the 24-hours of Lemans in 1966 and 1967 with a 7.0-liter powered GT 40. The British racing team of John Wyer Automotive Engineering won the titles for 1968 and 1969 in a GT 40 with the same platform, making it four consecutive years of dominance for the Ford GT 40 racer at the 24-hours of Lemans. 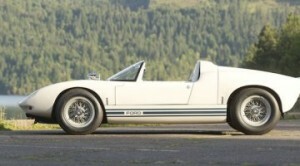 design, celebrity filled cockpit, and unique nose ant tail section design have prompted speculators to rate the potential value of this car above that of several other GT 40 prototypes that have been auctioned in recent years. 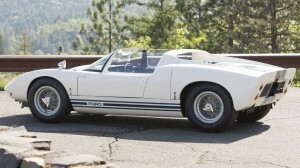 In 2012 the car that was used in making Steve McQueen’s 1970 racing film “LeMans” sold foe $11-million and another sold for over $7-million last month in Houston, Texas at a Mecum’s auction. While no one is placing an exact dollar amount on the value of the car, they are not bashful about saying that it will be in the neighborhood of eight-figures. It will be offered during the RM Auction in Monterey, California taking place from August 13 through 16, 2014 at the Monterey Conference Center and the Portola Hotel and Spa. Judging by the latest photos of the GT 108 car, it is in excellent condition. The Wimbledon White paint job has stood the test of time and the Windsor Blue stripes provide the perfect accent. The car’s extremely low center of gravity and aggressive lines leave no doubt about its competitive focus. 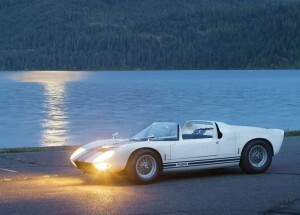 He GT 40, so named because of the Grand Touring style of racing for which it was created, as well as for the overall roof height of the car, which was 40-inches (the minimum allowable limit under Lemans series racing rules). The most obvious characteristic of the entire exterior is potentially the open roof design. After Ford officially retired the GT 108, it was used a few times as a pace car in nationally televised events, and then parked for a couple of years. Later, the car was sold to a succession of private owners and has made numerous appearances in car shows and vintage races around the country. The twelve GT 40 prototypes were mid-engine equipped cars with three primary engine configurations; a monstrous 7.0-liter, a 5.0-liter, or a 4.9-liter — all were naturally aspirated V8s. Compared to the Ferrari racers of the day, the Ford engines were somewhat larger. The GT 108 is outfitted with the 4.9-liter (289 cubic inch) engine. The exhaust is a tuned type with a resonator that culminates in a heap (frequently referred to as a “bundle-of-snakes”) atop the Colotti T 37 four-speed manual gear box. The Colotti racing transmission is controlled using a multi-disc racing clutch that offers the driver very little room for error. It is either engaged or disengaged with almost no slack and the transmission has no synchronizers. The engine, equipped with down-draft Weber carburetors and the one-of-a-kind exhaust, emits an exhaust note that instills fear in the competition yet the engine idles smoothly, accelerates effortlessly, and has a redline of 6.500-RPMs. The interior of the GT 108 is that of a race car. Every component is functional with no room for cosmetics. The seating is moderately comfortable, though you are positioned deeply in the tiny monocoque structure between the stressed side sections and narrow center tunnel, which contains 39-gallons of fuel. The brake, gas, and clutch pedals are positioned comfortably on an adjustable rack that allows for maximum driving comfort and driving efficiency. The short-throw gear shifter is positioned just to the right of the leather bound, flat-bottomed steering wheel.